Few studies explicitly address competition between species of algae in lotic ecosystems. It is well established that algal abundance in artificial streams changes in response to adjustments in nutrient, light, or current regime, and also undergoes succession under a particular environmental regime. Many field studies describe shifts in algal dominance associated with changing environmental conditions. The tendency for filamentous green algae to dominate under high light levels is suggestive of a competitive advantage, while their scarcity under low light regimes may be due to the reduced pigment diversity of chlor-ophytes relative to other common stream algae (Steinman and McIntire 1987). Such patterns might be viewed as evidence of the potential for competition, but they can be equally well explained by a model in which species with independent and nonoverlapping requirements replace one another along environmental gradients over space and time. The longitudinal distribution of Achnanthes deflexa and a species of Chlorella in the effluent plume of a sewage outfall is indicative of a competitive interaction (Klotz et al. 1976). Together these two taxa comprised nearly 90% of the epilithic algae at all sites studied; Chlorella was most abundant nearest the outfall, while A. deflexa increased with distance. When cultured alone, A. deflexa grew well at high concentrations of effluent, but in mixed culture Chlorella dominated at higher effluent concentrations and A. deflexa at lower concentrations, corresponding to their field distribution. Additional studies ruled out any extracellular inhibitor, leading Klotz et al. to conclude that the competitive superiority of Chlorella under high nutrient conditions was due to a combination of nutrient depletion and occupation of space. The response of different members of the pe-riphyton to nutrient addition is also suggestive of competitive effects. In comparing the influence of nutrient availability in the water column versus nutrient diffusing substrates, Pringle (1990) observed the diatoms Navicula and Nitzschia to dominate the overstory and interfere with the establishment of understory taxa Achnanthes and Cocconeis. The development and succession of diatom assemblages on glass slides suspended in two reservoirs exhibited species replacement and overgrowth by taxa of high physical stature, an indication of competitive interactions (Hoag-land et al. 1982). Considering the diversity of periphyton species and variety of growth forms (Figure 6.1), and the likely competition for substrate space and access to light, future studies of individual algal species may be expected to provide stronger evidence of the importance of competitive interactions within assemblages of benthic algae. Many studies document habitat partitioning among stream-dwelling invertebrates. Temporal separation of life cycles over seasons is frequent among the univoltine insects of temperate streams, and differences in diet are reported principally in animals that consume easily categorized food items. The distribution and abundance of filter-feeding caddisfly larvae provide an attractive system for the study of resource partitioning, as they utilize the common resource of fine particulate organic matter (FPOM), require space to attach their nets, and have seemingly ample opportunity for resource partitioning via differences in the mesh size of capture nets and location of attachment. Indeed, differences in food particle size consumed (Wallace et al. 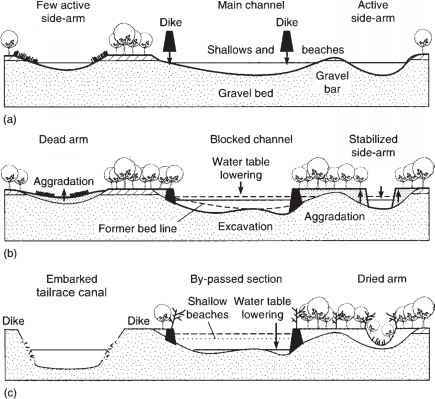 1977), microhabitat distribution (Hildrew and Edington 1979), longitudinal distribution (Lowe and Hauer 1999), and life cycle (Mackay 1977) have each been demonstrated. The instars of a species also differ in habitat use, and their preferred current velocity typically increases over their development (Osborne and Herricks 1987). On the other hand, it does not appear that either food or space commonly is limiting to co-occurring caddis larvae. After estimating the size fraction captured by six filter-feeding caddis larvae as well as total availability of organic particles, Georgian and Wallace (1981) found no evidence that food was limiting or that resource partitioning occurred. The size fractions captured showed very high overlap, and amounted to only about 0.1% of available FPOM. 1987), but Muotka (1990) found only partial agreement with this expectation, and in one study the species with the smallest mesh net was most abundant at the highest velocities (Wallace et al. 1977). 1988). The periods of maximum larval growth were sufficiently out of phase among five species of riffle-dwelling Ephemerella mayflies to ensure at least tenfold size differences on any given date between the most closely related species (Figure 5.14). Highly synchronized, non-overlapping life cycles among presumed competitors are not always the rule, however. Of six leptophlebeid mayflies in a New Zealand stream, only two had reasonably well-defined growth periods, and overlap of life histories was pronounced (Towns 1983). As with resource partitioning along microhabitat and food axes, temporal specialization likely is offset by the advantages of flexible habits and life cycles. To evaluate whether temporal partitioning should be attributed to competition, Tokeshi (1986) developed a null model of expected overlap by assuming that species' life cycles were distributed independently of one another throughout the year, with the constraint that most growth should occur during favorable seasons. For nine species of chironomid larvae living epiphytically on spiked water milfoil and consuming a similar diet of diatoms, actual overlap of life cycles was greater than expected by chance alone. Since this result is the opposite of that expected in temporal partitioning, it appears that all nine species were tracking seasonal peaks in resource abundance. Competition, if it occurred, was not manifested in temporal partitioning. Resource partitioning within fish assemblages has received a great deal of study, and as with macroinvertebrates, extensive segregation can be documented along the axes of diet, habitat, and time. In a review of some 116 such studies conducted primarily with salmonids of cool streams or small, warm-water fishes of temperate regions, Ross (1986) found that segregation along habitat and food axes was about equally frequent while temporal separation was less important. However, even among similar faunas the importance of space, food, and time axes varied considerably. Although the resource partitioning perspective is upheld in many studies, other researchers report greater overlap and attribute co-occurrence to a combination of individual specializations and the importance of environmental variation in mitigating competitive interactions. Studies of darters and minnows in North America provide examples of low overlap in species' distributions or in microhabitat and feeding position at a single locale. Eight species of cyprinids that co-occurred in a Mississippi stream showed considerable microhabitat segregation with respect to vertical position in the water column and association with aquatic vegetation (Baker and Ross 1981). Only two species failed to separate on these two axes, and one was the only nocturnal feeder in the assemblage. Direct observation by snorkeling in streams of West Virginia found evidence of habitat partitioning by depth, substrate size, and water velocity for 10 darter species. Percina typically occurred in the water column, whereas species of Etheostoma were benthic and segregated by occurring under, between, and on top of rocks (Welsh and Perry 1998). Moyle and Senanyake's (1984) study of an even more diverse group of fish in a small rain forest stream describes a highly structured assemblage with minimal overlap based on fish morphology, habitat use, and diet. The extent of resource overlap versus partitioning is likely to vary with food availability owing to opportunistic feeding when certain prey are very abundant. 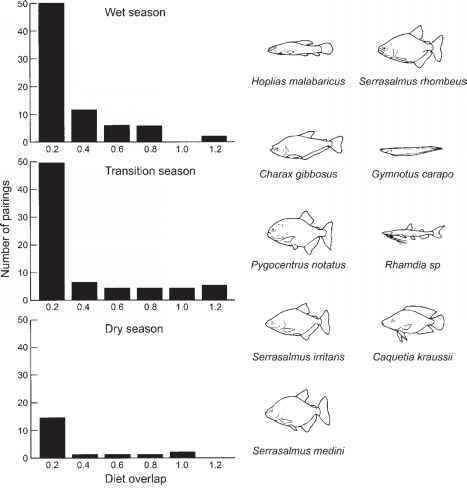 Seasonal changes in diet overlap are well illustrated by Winemiller's (1989) study of nine species of piscivorous fish that were abundant in a lowland stream and marsh habitat in western Venezuela. Members of this guild exhibited substantial resource partitioning in food type, food size, and habitat. Of the possible 72 species combinations among the nine piscivores, only one pair of fin-nipping piranhas exhibited substantial overlap on all three niche dimensions. For the most part, diet overlap of pairs of piscivore species within their feeding guild was low (Figure 912). Highest overlap occurred during the wet season when prey were abundant and lowest overlap occurred during the transition season when prey were least available. Thus, despite the opportunities for competition in this species-rich tropical system, food resource partitioning was widespread. Winemiller (1991) concluded that the higher species diversity of tropical fish assemblages relative to temperate assemblages was paralleled by higher ecomorphological diversity, which facilitates niche partitioning and reduces competition. Some studies of habitat partitioning among stream fishes have reported segregation between groups of species occupying distinct microhabitat guilds but considerable remaining overlap at the species level. In an observational field study of six minnows in an Ozark stream, using the habitat variables of water depth, current, substrate, vertical and lateral position of the fish, and their use of pools, riffles, and glides, Gorman (1988) found a clear separation between species occupying higher versus lower water column position but considerable overlap among species within those two categories. The fishes of Coweeta Creek, North Carolina, were separable into three microhabitat guilds: ben-thic, lower, and mid-water column, but differences in microhabitat use between species within these guilds were not easily distinguished (Grossman et al. 1998). This is interpreted as evidence that environmental variation is more influential than resource availability in limiting population densities of stream fishes, as several authors have argued (Baltz and Moyle 1993, Gorman 1988). In this view it is advantageous that fishes exhibit flexibility and overlap in their use of resources, and assemblage structure reflects the combined influence of environmental variation, particularly in hydrology, together with differences among species in their individual ecology. result from invasions, range expansions, and intentional introductions. The distributional patterns of salmon and trout afford many opportunities for evaluating competition because fishermen and managers have thrown together ecologically similar species which, until 50 or 100 years ago, had nonoverlapping ranges. So, for example, European brown trout are repla cing brook trout through much of their native range in Appalachian and Midwestern US streams, restricting the latter to headwater reaches (Fausch and White 1981). Moreover, interspecific aggression among salmonid species is well known, thus lending plausibility to the view that competition is important in species replacements. Fausch and White (1981) recorded the daytime positions of brook trout in the presence of brown trout, which is the behaviorally dominant species, and then removed brown trout from a section of a Michigan stream. Brook trout subsequently shifted to resting positions that afforded more favorable water velocity characteristics and greater shade, and this habitat shift was greatest in the larger individuals. In laboratory streams, native brook trout consumed less food, lost weight, and contracted fungal infections in the presence of hatchery brown trout (DeWald and Wilzbach 1992). In closing, the extensive literature on resource partitioning clearly demonstrates that species differ in their habitat use, food capture abilities, and timing of activity or growth. These are in effect descriptions of the specializations that constitute a species' niche. Such differences constitute weak evidence of competition, as they do not resolve whether species adversely affect one another, or whether these examples of niche segregation reflect ecological specializations acquired and fixed over the species' evolutionary history, referred to as the ''ghost of competition past'' (Connell 1980). It is for these reasons that recent work has focused on more rigorous tests, typically involving experiments under fairly natural conditions, and we now consider such studies.